System with a focused electron and ion probes QUANTA 200 3D (FIA, Netherlands), which is mounted on the base of analytical complex Pegasus 4000 (EDAX, USA). Quanta 200 3D – multifunctional scanning electron microscope with an integrated focused ion beam. The combination of traditional scanning electron microscope (SEM) and focused ion beam (FIB) in one instrument allows us to supplement the three-dimensional analysis of research materials at the nano-level objects. Scanning electron microscope microanalyzer-SEM-501 B (Philips, The Netherlands) is attached to its base of X-ray spectral analytical complex WEDAX-2A (EDAX, MICROSPEC, USA). Scanning electron microscope SEM-501 B is designed to study the surface of solid, materials resistant to vacuum. Analytical complex WEDAX-2A consists of energy dispersive X-ray spectral analyzer and EDAX 9100 X-ray spectral analyzer with wavelength dispersive WDX-2A. Desktop Scanning Electron Microscope TM3000 is extremely easy to operate and has a very compact size, making it ideal for educational institutions. Low vacuum mode allows you to explore the non-conductive samples without spraying. Easy to use graphical user interface and ease of maintenance allow its use in the educational process. The device is equipped with energy dispersive microanalysis attachment OXFORD, which significantly expands the range of tasks. Confocal laser microscope LEICA TCS SPE – this is a point scanning confocal system with a spectral detector for fluorescence registering the spatial structure of living and fixed objects. As the light source are lasers with high intensity and the monochromaticity of the radiation. The system consists of four solid-state laser with a wavelength of 405, 488, 532, and 635 nm. Confocal microscopy is widely used in the fields of biology, medicine, biophysics, molecular and cellular biology. It allows you to explore the tissue at the cellular level in a state of physiological activity. Atomic force microscope (AFM) – scanning probe microscope high resolution. 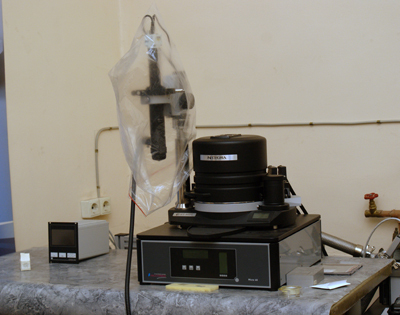 Principle of the AFM is based on recording the force interaction between the surface of the test sample and the probe. Studies can be conducted in air, vacuum and fluid, which opens the possibility of studying biological macromolecules and living cells. AFM is used to study the surface topography with a resolution of tens of angstroms to the atomic.